CALL FOR ENTRY is closed for 2019, thank you! The Young Media Makers is a community program, for anyone between the ages of 8 and 22, that provides young people with an opportunity to learn and practice digital video production and editing. 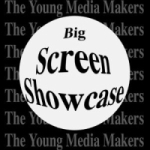 The Young Media Makers Big Screen Showcase is an annual open call festival that has two divisions. The Junior Division is for movies made by 8 to 13 yrs old and Senior Division 14 to 22. This is an annual opportunity for ages 8-22 to publicly showcase their movies, have an opportunity for public speaking, learn more about the career expectations and opportunities from key note speakers, and talk with academics about future projects. At the post screening reception, you will be able to talk with media teachers and other filmmakers about your future projects. All movies that are submitted by the CALL FOR ENTRY deadline March 15 will compete for prizes in their selected category.